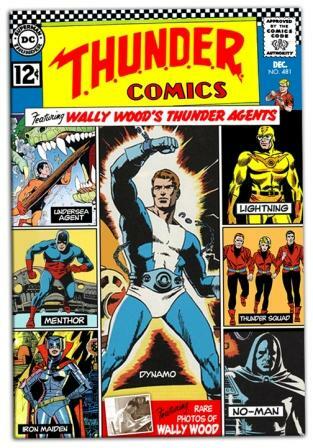 Deluxe Comics managed just 5 irregular issues of “Wally Wood’s Thunder Agents” between 1984 and 1986. No Wally Wood art was to be seen. He had died in 1981 at a mere 54 years of age. He had however overseen the original run of T.H.U.N.D.E.R Agents from Tower Comics in the 1960s. 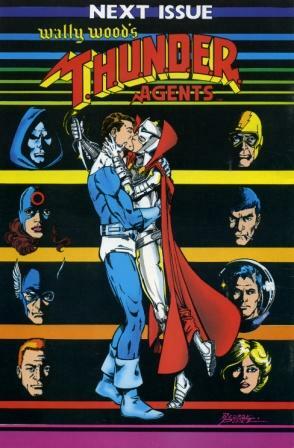 Deluxe Comics were involved in legal action over the rights to these characters with JC Productions who had also tried to revive Thunder Agents in 1983. The case hinged on had Wally Wood owned the characters rather than Tower Comics. In legal cases over ownership of title the main winners seem to be the lawyers. Until the 1970s it was assumed that any new character invented by a comic book writer or artist immediately became the property of the comic book publisher thanks to the small print that accompanied their payment for script/artwork. This was finally contested in the 1970s and eventually creator-owned characters became the norm. Steve Gerber was unfortunately caught up in these problems with “Howard the Duck”. Although he had devised Howard it was Marvel Comics who owned the character and who could sell the Movie rights. The fascinating account of Mr Gerber’s predicament is here. And talking of Alternate Universes…………….if you’ve never ever visited www.dialbforblog.com then now is the time. Here you can see hundreds of comics that never were but might have been……..